Օn October 3th a donation ceremony took place at the video gallery of the Mesrop Mashtots Matenadaran. The philanthropist of Matenaran, Iranian-Armenian philologist, writer, teacher, well-known public figure Levon Minasyan's daughter Armine Minasyan from New York, donated to the Mashtots Matenadaran 21 items of ancient valuable books and Armenological literature of 1668-1912 from her father's personal library. The Matenadaran’s director Vahan Ter-Ghevondyan delivered an opening speech. The Matenadaran’s head of the depositories Gevorg Ter-Vardanyan, the head of the department of press and printed literature of Armenian studies Raya Blbulyan and the donor Armine Minasyan delivered speeches. 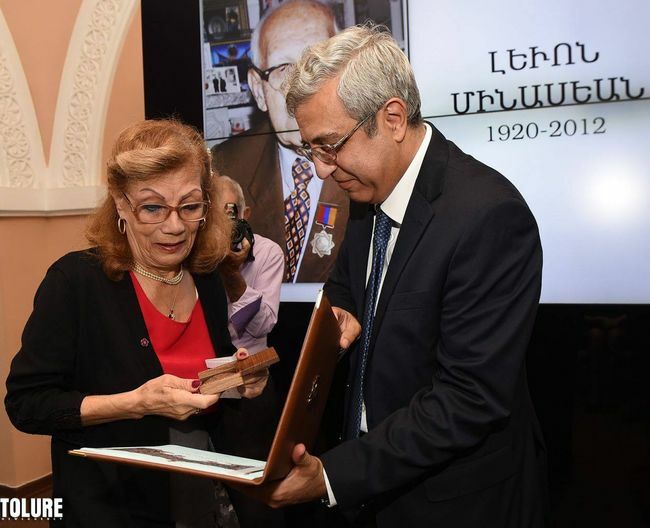 The Matenadaran’s director Vahan Ter-Ghevondyan handed Armine Minasyan a "Matenadaran" Commemorative Medal. Levon Minasyan is the author of about 80 books, he has been awarded the Orders of Mesrop Mashtots and Hakob Meghapart, the Medals of Cilician Knight and V. Saroyan, and the Medal of New Julfa’s Charitable Association. Levon Minasyan was the director of the museum-printing house of the Holy Savior Cathedral in New Julfa. In 1997 Levon Minasyan was awarded the title of "Man of the Year" in 1996-1997 by the International Biographical Center of Cambridge.